Check a detailed forecast for Seville (Spain) before getting there! You should check the weather forecast for Seville before your holiday here. Even though Seville’s weather is usually mild almost all year round, it’s better to have a look at the temperatures before traveling. In case you don’t know, it gets hot in summer! REALLY HOT! Make sure you know how to keep cool under such conditions. Sometimes winters can be wet and you may need an umbrella (or a hat). But the temperatures remain nice so you won’t have to worry about the cold. Here is the 5 day weather forecast for Seville. To make things easier, temperatures are detailed both in Celsius and Farenheit. 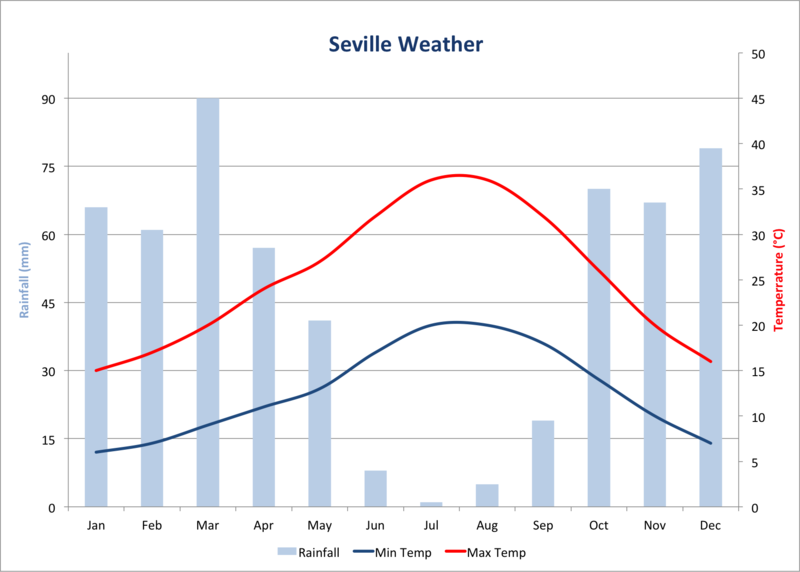 In order for you to have an idea of what you can expect regarding temperatures and rainfall here is a climate chart for Seville. These are average figures that you can use as a rough guide. You may find even better weather! Find out the forecast for Spain.